Think that Chipotle is only a place where you can pick up some delicious Mexican food? Well, think again. The restaurant has just come out with its first full-length web series for Hulu called Farmed and Dangerous. When you think of Chipotle, the first thing that probably jumps to mind is the wonderful aroma of their grill. Especially when it’s working overtime to produce those delicious burritos and other items on their menu. The food chain is hoping to soon be synonymous with TV when it debuts a new series on Hulu next month. The series, called Farmed and Dangerous, pokes fun at the world of industrial agriculture and the trailer promises a wild and crazy foray into a world full of corporate greed, deformed chickens and exploding cows. Judging from the previews, the series looks like something you could very easily see on a major network. It’s got some big names starring in it — like Ray Wise — slick cinematography and an upbeat soundtrack. But underneath the humor, there’s a deeper message about the industry of agriculture and the dangers of what is being put into our food. Don’t think of Farmed and Dangerous as one big commercial for Chipotle, though. On the contrary, it appears that you’ll be hard-pressed to find any mention of the brand at all. Rather than a four-episode advertisement, viewers will see a funny TV show with a very strong message and warning. Think of it as a really long PSA — with exploding cows. Farmed and Dangerous isn’t the restaurant chain’s first venture into the world of video entertainment backed by a message. Last year, the company produced a truly haunting video called “The Scarecrow.” While the world it depicted was one made of imagination, the horror comes from knowing just how close we are to that reality. Go check it out on YouTube and if you get through it without getting a little teary-eyed, then you’re made of stronger stuff than we are. 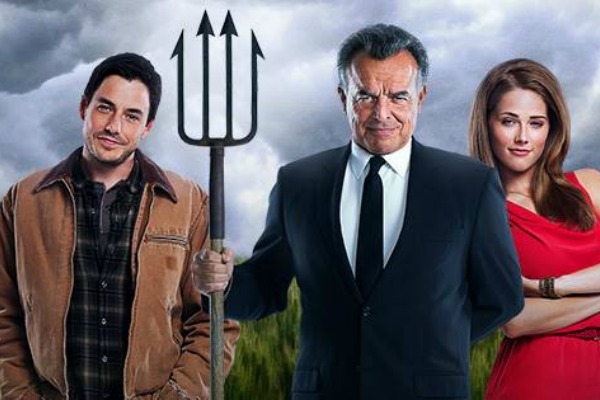 Hulu will begin airing Farmed and Dangerous on Monday, Feb 17. Check out the trailer for the series below.